After finishing college and moving to New York I saw my first silent film in a movie theater, probably at the Bleecker Street Cinema where I was working at the the time. Even more memorable were the occasional silent film screenings at the Carnegie Hall Cinema with live accompaniment. Silent films were never really silent and here was a link to the past, to the time when movies were performed by musicians who, at their best, really understood the art of the live cinematic experience. The Carnegie Hall Cinema is probably where I first saw Lee Erwin, an elegant man then in his late sixties, accompany a silent film. He played at least once a month, and did so with such dedication, precision, and joy that he seemed to lift the films from the past and deposit them directly into the theater. But the real revelation was hearing him perform on the huge pipe organ of the Cathedral of St. John the Divine. The precision and power of the massive organ and its towering tubes was like an adrenaline injection straight into screen. These memories flooded back to me when I learned that Makia Matsumura, who I had met within the context of her band m2duo (a collaboration with violinist Machiko Ozawa), was performing for silent films. I was intrigued. Since 2003 she has accompanied silent films in Japan and Italy, and began, in 2008, to play in the United States, including at numerous theaters and museums in New York. She also scored the soundtrack for the Kino International DVD release of the 1923 Frank Loyd feature Within the Law. Makia first began performing at the Walter Reade Theater at Lincoln Center in 2010 and, on September 8 and 9, 2012 she performed in the Film Society of Lincoln Center series “Capturing the Marvelous: Ukranian Poetic Cinema”. Both films were classics by Alexander Dovzhenko: Zvenigora (1927) and Earth (1930). We met in the busy Indie Food and Wine Cafe at Lincoln Center before her accompaniment of the screening of Earth. Makia was gracious enough to discuss her work before crossing the street and sitting at the piano to play for an audience eager to turn back the clock to the days when films were silent but the music that accompanied them was anything but. Thomas – What is it like to prepare for each of the films? This will be the second film that you perform this weekend. What is the preparation process like to prepare for the performance? Makia – This time I was lucky to see the film beforehand so obviously I could learn how the story develops, what the background will be, what the visual tone of the film will be. How the story would proceed, is it an action narrative, slow paced, like that. It helps a lot to have that information. Depending on the film I might do some research. If a movie is set to a certain historic period, if there is a dance hall scene or something that might call for a specific reference to a certain type of music, then I might do some research. I might not play that exact referential piece from my research, but it helps me to get an idea as to what kind of music could go with the film. T- Points you in the right direction. M- There are many different ways that you can play for any given silent film. Actually there is a freedom for a pianist with these films. T – But what I’m wonder is – did you say that sometimes you perform for a film without having seen it? M – Yes, if you are hired to play at the film festivals many time the films that you are assigned to play are fresh off the restoration process and more often then not the print you are going to play to is the only existing print in the world. There are many cases where it is impossible for the presenters to give me a copy. So in that case I have to play it cold, without watching beforehand. T – So you are almost guessing where the film is going to go sometimes? M – Yes, but at the same time the films are from a time when the medium was in its infancy. So there wasn’t too much of the tricky technological things going on. And also the stories tend to be pretty straight forward. When you watch a certain number of films from that era you can pretty much guess, or at least narrow it down to maybe a handful of possible scenarios. T – The last time I saw you perform here it was the Rex Ingram westerns, which were very genre like. But today’s film, Earth, is a little different. It is an unusual story. Did you get to preview this film? M – Yes, yes. There is a coherent story line, which helps a lot. I tend to come out with music that goes with the storyline. It really helps me plot my plan, so to speak. Yesterday’s film (Zvenigora) was a little different. There were those insertions from the legend. So it was a little bit chopped up into segments so I had to come up with a way to make it musically coherent. T – To musically match that more staccato rhythm? T – Today you are playing on the grand piano. 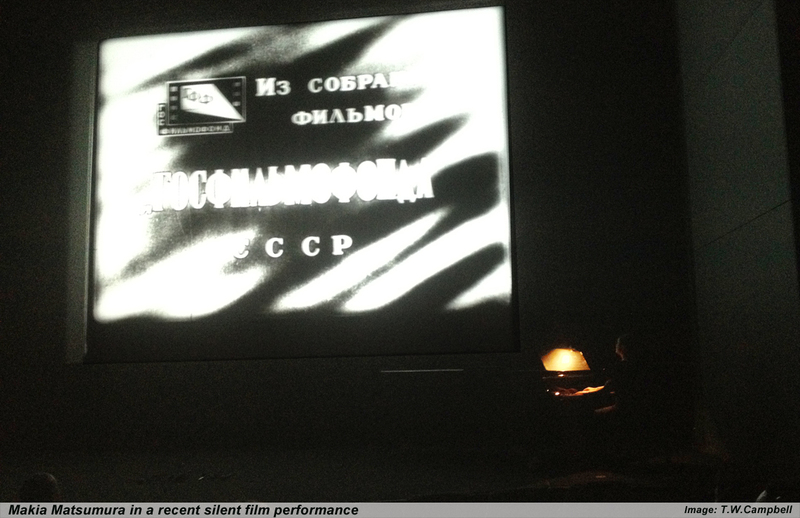 Have you performed on any other instruments to silent films? M – Well, Piano is the only instrument that I play. If you can play the organ there are some great theater organs still in use. I don’t play organ but that’s something that I would love to explore some day. T – We talked about preparing for a film, when you get to see it beforehand, in that case do you come in with a composition of sort, is everything in your mind? (Makia laughs) How do you remember – how do you think about a film as you’re performing? M – I improvise. Much of what I do is improvising. T – It’s a sense of working with sequences, and beats, and rhythms? M – Yes, if there is something like that it would be nice to be able to make musical sync, but at the same time if you do it to often it starts to become what people call “Micky Mousing”. It starts to become kind of boring, in a sense. People will begin to expect what is about to happen, they think they know what this pianist is doing and they lose focus on the movie. I think that’s the worse a silent pianist can do – to distract the audience’s attention from the film. The best compliment we get is “I didn’t realize there was live music after a while”. That’s the best thing to hear. (Laughing) So I try not to distract people from the film. T – Is there anything different from the performer’s perspective about today’s film? M- Yesterday and today’s films were made by the same director (Alexander Sovzhenko) and there is only about 3 years between them, but the pace of Earth is so different from Zvenigora. Yesterday’s film was kind of chopped up, hard to follow. Today’s film is very sequential and I found the place very slow. Slower than many of the European films of the time. It’s going to be a good challenge for me today. T- One moment from Earth that stands out is the repetitive sequence of the farmers waiting for the tractor to come. T- How are you going to approach that sequence? It is obvious repetition, something you don’t see a lot in films these days. T – Maybe using repeating phrases…? M – I don’t know where I will be by the time we get to the scene (We both laugh) So, I’ll see. When I first started to play for silents I used to make really detailed notes. And I would try to assign a musical leitmotif to certain characters only to find out that when I started to play in the theater… Well firstly the screen is so huge and the pianist is even closer to the screen than the audience. It looks so much different from the way it looks on the small screen at home. Then there is the frame rate potential problem. And there is a live audience to my side. It always inspires me and I end up playing something totality different from what I had prepared. M – Now I will come up with a main theme for the film but that is as much as I will prepare. Because I know I will start to do something really wild once I am up on the stage (laughs). T – Yeah. And it would be totally different than if you were to go into the studio and be scoring this film. M – It would be totally different. T – What are you doing now? What’s you most musical involvement right now? M – I have a full time job, and that is pretty demanding. Silent film performances are what I do the most. And I also have a duo with a violinist called m2duo. Machiko will be coming to see the film today. We have a short showcase coming up in November, so are really excited about it. We’re still looking to put together our own show before the year ends. T – Do you have any other silent films scheduled at the moment? M- Not scheduled. The Film Society of Lincoln Center has been really gracious to me when they need a pianist. And there are also a couple of museums around town who when they realize they have silent film coming up will call me – usually a couple of weeks before. T – And they may or may not have a copy of the film for you to see. M – Exactly. You know, there is a master class for silent film pianists in Italy. They have a silent film festival in Perdenone. I attended the master class, and that is where I learned how to score, for example, without seeing the film beforehand. There are many wonderful pianists hired to play to accompany the films at the festival – more than a dozen pianists roaming around – so while they were at the festival they would teach less experienced pianists. Every day we would have a different teacher, each one would have a different technique, you know emergency techniques to deal with the improv. It was really interesting and helpful. The most helpful thing is that there is no right way or wrong way to play. And secondly, you always have to respect the film. Sometimes you even have to sacrifice musical coherence for the sake of playing something more suited to the film. Because you are not playing a concert, you are accompanying the film. I was really fortunate to go there and to study with such musicians. T- Thank you so much. I know you have a performance to go to. M – Perfect. Thank you. This entry was posted in The Filmmaker's Perspective and tagged Film Composer, Film Society of Lincoln Center, Makia Matsumura, Silent Film Performance, Thomas W. Campbell by Thomas W. Campbell. Bookmark the permalink.